Best little country shop I've been into in a VERY long time. 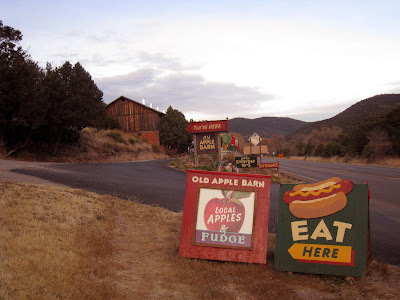 Cloudcroft, New Mexico. It has only just begun - those dreadful days leading up to the holiday. And by saying dreadful, I'm being nice. And the reason I'm being that nice? Because if I wasn't, I'd have to stab myself in the eye. Why the eye? Because that would impair my vision enough that I would not be able to shop on a Saturday. Who the EFF shops on a Saturday??? Crazy people, that's who. Dear. Mother. Of. God. Doesn't everyone know the economy is in the toilet?? STOP shopping, people. Go home. Save your money. Make crafty presents this year. And get the hell out of my way!! I don't have time to make crafty presents. And...because I'm once again participating in the UPS Run With The Devil, I barely have time to shop at all. Again this year, Ed and I will help UPS deliver their packages. Three weeks of drive/sleep/drive/sleep/drive/sleep; this is not at ALL our usual routine. Where is the time for a latte? How am I going to have a leisurely lunch at Chipotle? What if I need an emergency mani/pedi?? It's not happening. We leave on December 3rd and return home on December 25th. Uh, yeah, Christmas Day. So this year I have to have ALL of my shopping done before I leave on Wednesday morning; wrapped and ready to be put under the tree. Oh, no pressure at all. Did I mention I hate shopping? Stores on the day after the day after Thanksgiving (otherwise known as Black Friday) are just as horrible to shop in as they are on that day. The madness has just begun. My main concentration will be my three nephews, who just happen to be the three hardest people to buy for. And to make it worse, one of them has a birthday a few days after Christmas, so I have to shop for that too. My head hurts. If your gift doesn't make it on time this year, cut me some slack; you might get it by July. On Friday I often post a photo of my favorite nut, Eddie, but today I opted for my second favorite nut, the pistachio. They were adorning the holiday table and I liked the limey green color peeking out! I so wish I could take credit for this picture of our holiday table. But since I didn't take it, I can't claim it. It's another one taken by my nephew and I think it's a pretty good shot. I guess I can say he's only interested in photography because of me, so I suppose I can take a little bit of the credit! 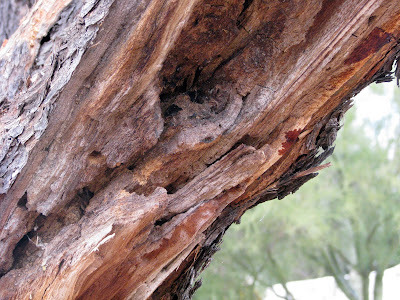 Mequite Tree. Photo taken by my eight year old nephew. My step-father recently went to the eye doctor for a check-up and while in the examining room, the doctor asked him what was going on. My step-father told him that he'd been having some issues with double vision and not being able to see too clearly. "And how long has this been going on?" the doctor asked. "A while..." my step-father hesitated. The doctor commented on how long it had been since his last saw him and said, "So what made you come in for this visit?" "Well...my wife made the appointment because she caught me driving with one eye." Is this what it takes to get a man to go see a doctor once in a great while??? If it were up to him, he wouldn't have gone in until he woke up blind. Pssst! The Fish Are In The Water. Check The Water. The great egret is a tall white heron that has a long graceful neck, long black legs and black feet. Its long pointed bill is yellow. Like the great blue heron, it uses a "stand and wait" method of catching fish. It wades in shallow water till it finds the right spot to wait for its meal to swim by, then it stabs it with its sharp bill. During breeding time the great egret has beautiful lacy white plumes on its back and tail. Unfortunately, these feathers are what almost caused the bird to become extinct. Before it was protected by law, the great egret was hunted and killed for those lovely white plumes. Part of the EPCOT fireworks grand finale. It's the best I could do without a tri-pod. Two hundred seventy two dollars and fifty three cents. 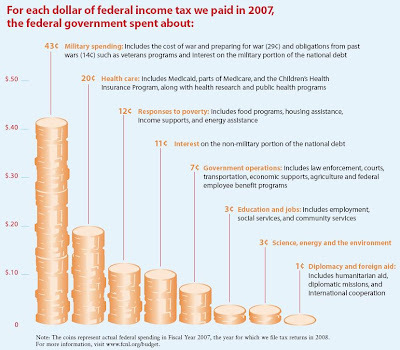 That's $272.53 for those who have trouble turning words into numbers. That's what it cost for us to spend eight and a half hours at Walt Disney World's EPCOT park; and two thirds of that price was just to park and walk through the gate! Pricey yes, but that was not the reason I had for not wanting to go. If you know me at all, you will probably have guessed that I was anticipating hating this adventure. First, it's in Florida. And what does Florida have? That's right, lots of sun. And what does lots of sun produce? Right again, lots of heat. And heat can be the deciding factor in whether I'm going to hate something or not. Want me at your wedding? Don't have it in June. Think I'll attend your kids graduation? Not likely, if it's outdoors. Considering inviting me for a day of "laying out" by the pool? Think again. So the mere fact that EPCOT is in Florida meant this "adventure" was already inching its way over to the Never Gonna Happen column. Add to the heat factor the other main component of Disney World, kids, and the chances of me wanting to be there exponentially decrease. I was not about to sit in the truck by myself though, so I gave in and decided to join Ed. I have to say, I was pleasantly surprised. It was a really nice day (and by nice I mean, not too hot) and the parking lot was barely full (which meant not too many kids) This might not be so bad, I thought as I climbed out of the truck. Truth be told, I really enjoyed it. 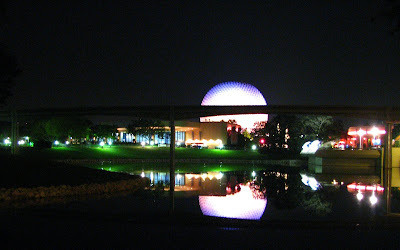 We started out by taking the Mission Space ride which is housed in the iconic EPCOT globe (seen above at night). It was very interesting; nice and slow (no crazy twists and turns to make me queasy), fun, informative and ended in an area where we could show you what Eddie and I looked like while in space and then what I looked like right after I landed! Once you get into the interior of the park, there is a lake in the middle surrounded by Pavillions from various countries; Canada (which we skipped since we were just in the REAL Canada), China (where we had dinner), France, Germany, Italy, Japan, Mexico, Morocco, Norway and the United Kingdom. Of course, if you've been to EPCOT you know the deal, but it's nice to see each Pavillion staffed with native speakers of that country, many of who come just to work and go to school here in the US. We watched a movie called "Reflections of China" which was shown on a screen that circled the room and then saw the film "Impressions de France", which we enjoyed so much we went back to watch it a second time! We had Bavarian pretzels in Germany, Chinese food in China and pastries and coffee in France; all without leaving the country. The evening ended with one of the most amazing fireworks shows I have ever seen....I will post a photo tomorrow. Next we tackle The Magic Kingdom! Click here to see Ed being abducted by aliens. I think he deserves an Oscar. Or at least a RAZZIE. I captured this colorful little Mallard in Orlando, Florida. 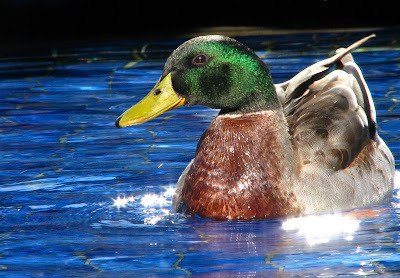 * A male Mallard is called a drake. Since we're delivering a load to Orlando, Ed wants to take me to Walt Disney World. Kids, lines, sun, kids...let's say I'm not too thrilled about the idea. I'm truly hoping it's not a repeat of the worst day of my life. 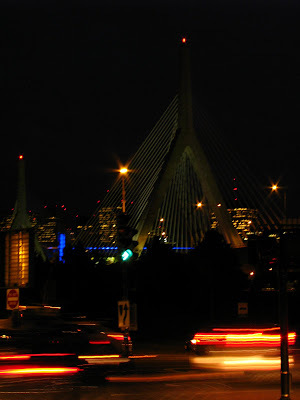 So we're sitting in the truck at a truckstop up in Maine when Ed says, "Look! A fox!" and I'm all like, "I am looking pretty good today, aren't I?" and he's all like, "No, a real fox!" I don't know how well he did with his wandering since his eyes seem to be closed but maybe he just came out of his fox den and is squinting because he forgot his little foxy sunglasses. 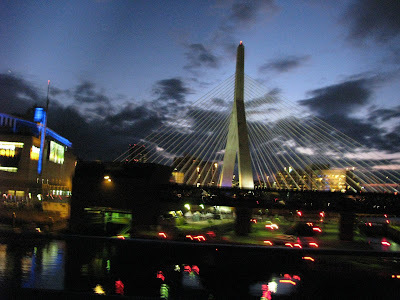 The Tobin Memorial Bridge (also known as the Mystic River Bridge) is the main structure over the Mystic River, connecting the Charlestown and Chelsea sections of Boston. The view was spectacular because it was cold out and when it's cold, the skies are extremely clear, so every light twinkled and every color was more intense. The pictures look better in the smaller format since they are kinda blurry when enlarged; I guess that's what happens when you take pictures from a moving truck! My friend Vicki, who in the last two years has broken out of her tomboy shell, has encouraged me to introduce some color to my wardrobe. I have, for the twenty years of our friendship, always favored black and neutral colors. On occassion, I will throw in a fuschia or red, maybe even a funky print here or there, but primarily I stick with darker shades. My mother has always wanted me to wear color also. She's the "artistic" type and has always dressed like a Puerto Rican on vacation; colors, prints and florals, very often in the same outfit. I don't think she even owns anything that's black. Would you say I was spinning that color wheel like a drunk woman?? 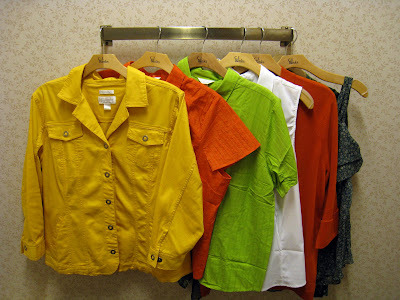 I didn't buy anything, but the yellow jacket was actually my favorite. It was a stretch denim (the stretch was kind of cool, I haven't seen that much movement ever in a denim jacket) and the buttons, which looked like rivets, were actually snaps. I liked that too. The ruffly tank on the right (which was a deep teal with tiny goldenrod and white flowers) looked really great with the yellow jacket. I've been looking more at how other women dress and have been trying to get some ideas for how I can incorporate dressing down (in a stylish way) into my life since my profession really requires me to embrace all things casual. I'm not really good with the casual look, so putting something together that looks good is hard for me. I think I owned one pair of jeans when I met Ed and I have had a really hard time adjusting my wardrobe for this lifestyle. I don't do sweats and I'm not a jeans and sweater type of person. That whole layering thing seems to be really popular - the long tee sticking out of the other tee sticking out of the sweater which sticks out of the jacket, topped with a scarf casually slung around the neck. Ugh. Layers can be a real problem for me as I HATE to be hot. As it was, I seemed to be the only person in Newfoundland who was sweating. We'll have to see how this color thing works out and what I do for my wardrobe in the next few months. I plan on getting rid of everything I have and starting over with all new stuff for January, so maybe I'll stay away from the black and try to get into more actual outfits that incorporate some color. It's been suggested that I try more button down shirts, maybe some fitted jackets and dark wash, bootleg jeans. If that doesn't work, I'll be the only driver on the road wearing velour track suits with the satin stripe up the side. With big hoop earrings and flip-flops, of course! 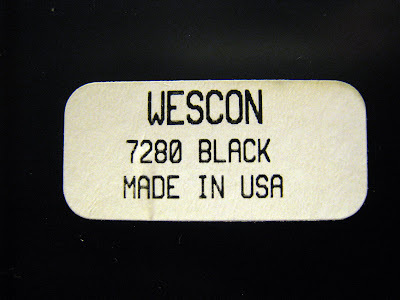 This label was found on the bottom of the ice bucket in my hotel room. Can you see what's unusual about it? * Astatine is the rarest naturally-occurring element, with the total amount in Earth's crust estimated to be less than 1 oz (28 g) at any given time. This amounts to less than one teaspoon of the element. Guinness World Records has dubbed the element the rarest on Earth, stating: "Only around 0.9 oz (25 g) of the element astatine (At) occurring naturally". 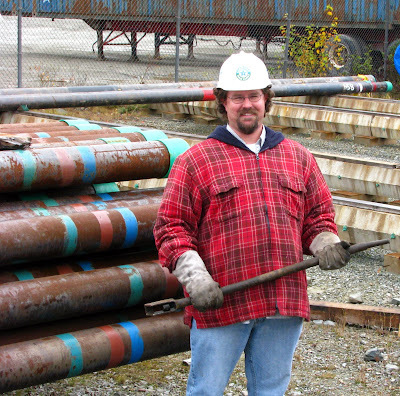 Eddie, as he prepares to unload the pipe we delivered to Paradise, Newfoundland. He's such a happy worker! The houses are SO colorful and even as you leave the harbor, the houses are just as unique, perched like bright little bits of confetti on the hill. It's kind of hard to get a "feel" for the color since the pictures are so blah, but every house is painted a different color; even the roofs are painted, often in a color other than that on the home. 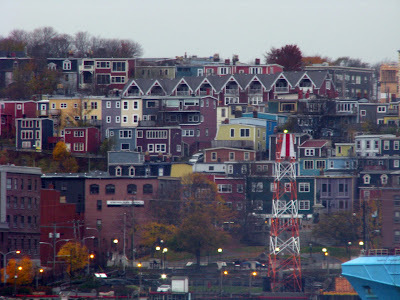 As I mentioned in a previous post, St. John's is the oldest English-founded settlement in North America, first sailed into by Italian explorer, John Cabot (Giovanni Caboto) in 1497. 1. First and foremost, the obvious: It's cold. 2. Signage in both French and English. It's like a road trip and a lesson all in one! 3. Poutine. A whole new kind of comfort food; delicious even without the cheese curds. 5. Moose. Newfoundland has approximately 125,000 - 150,000 moose on the island making it hard to believe we didn't see one during our entire trip! 6. The Canadians seem to love us as far as I can tell since they're all so very nice. 7. More importantly, they LOVE Obama. That's not in question at all - you don't even have to ask them, they'll just tell you straight out! 8. When you're in the Province of Nova Scotia, they have signs in both English and Gaelic, which is something I've never seen anywhere before. If it weren't for the english translation, we'd be screwed. 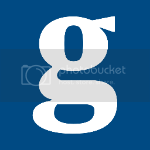 Have you ever tried to read anything in Gaelic??? 9. The cold water from the tap is freezing cold; not like water in Arizona where it comes out of the tap feeling like bath water. 10. The food labels/descriptions are also in English and French. My favorites are Pamplemousse Rose Jus (Red Grapefruit Juice), Poulet McCroquette (Chicken McNuggets) and Sucre (Sugar). 11. 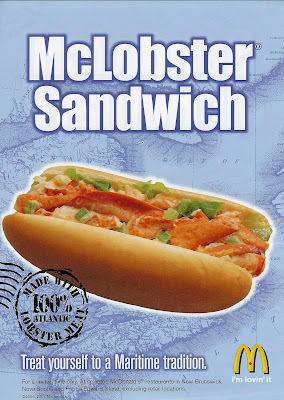 The McLobster Sandwich (or as they like to say in French, Sandwich McHomard), available only in the Maritime Provices. I've never eaten one, but I like the idea that it exists. 12. All the water! Oceans, lakes, ponds, inlets, streams...it goes on and on. It seems like Alberta is the only province that doesn't have all that much water, but they have the Canadian Rockies and Jasper National Park, so I will give them a teeny pass. I prefer the eastern part of the country (same as my preferences in the US) and I think Ontario and Quebec are my favorites, with Nova Scotia coming in third. Oh, the choices! I'm sure there are more, but I can't think of them at the moment. 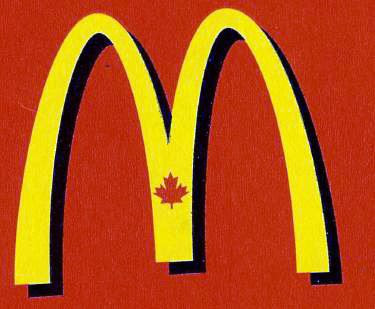 Overall though, I LOVE Canada, O Canada! 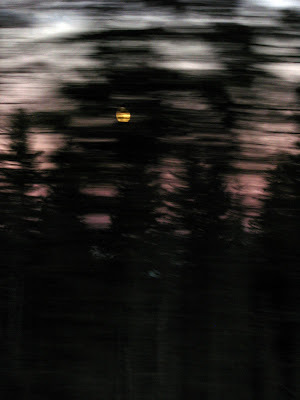 The moon in New Brunswick, caught between the trees as we whizzed down the Trans Canada Highway (TCH). The window view from our booth on the Marine Atlantic vessel Caribou taken during our crossing of the North Atlantic ocean from Port aux Basques, Newfoundland to North Sydney, Nova Scotia. The crossing takes eight hours and we've done it both at night (getting a private cabin for sleeping) and during the day. This crossing was a little choppier than the last three we took, but not enough to toss anything around; cookies or our Scrabble tiles. Unfortunately we have TONS of this type in the trucking industry; but at least he was smart enough to know his sign was going to be temporary, hence his use of scotch tape to post it. 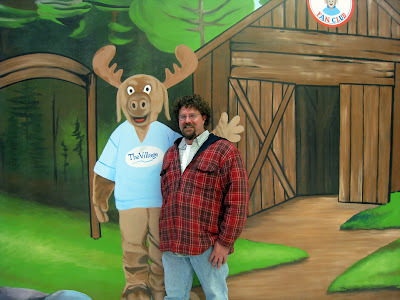 So far, this is the only moose we've seen up here in Newfoundland; and he was painted on a wall at the local mall! Can you tell how excited he is to pose with Eddie?? 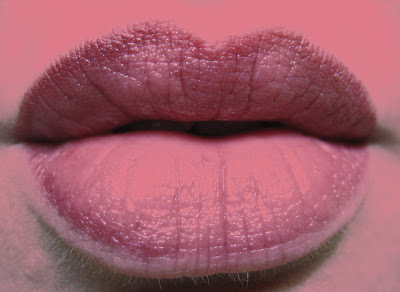 My lips, last week, courtesy of me. 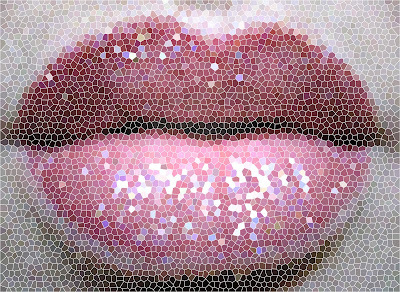 The sparkly mosaic and the pink glow, courtesy of photoshop. I had this post originally published yesterday, thinking I wouldn't be able to see the election coverage since I was traveling in Canada, but we got a hotel room in Nova Scotia and watched it happen. 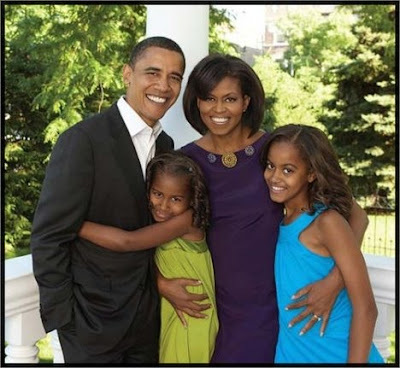 Barack Obama, his wonderful wife Michelle and his two beautiful daughters, Sasha and Malia. Watching the election in a hotel room in Canada. Watching and waiting. MM: You know, YO, I'm getting old and I hope you come visit me when I get older. YO: Don't worry, 'cause you'll be dead when I'm a teenager Nana. MM: What do you mean I'll be dead? I don't want to die young. YO: I mean, in eight years when I'm a teenager, you'll be very old and dead. MM: YO, give me a break. I don't want to die when you are a teenager. I want to see you get married! YO: Forget it, Nana. I'm living with Daddy all my life. We are getting ready for our second trip to Newfoundland. 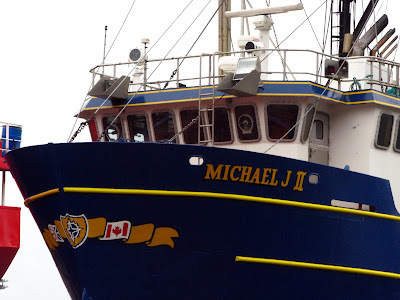 This time, we're heading to St. John's, the provinicial capital of Newfoundland and Labrador. 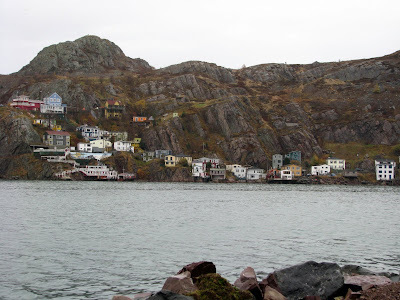 The city is located on the northeast coast of the Avalon Peninsula in southeastern Newfoundland, on the Atlantic Ocean. It is the easternmost city in North America and also the oldest English-founded settlement in North America, in addition to being the second largest city in Atlantic Canada. Since St. John's is the cloudiest (only 1,497 hours of sunshine a year), snowiest and has the most wet days per year of all the major cities in Canada, I'm not sure how the picture taking is going to fare, but I'll do my best. I have been told by some old classmates that the town has great pubs, great shops and a great downtown walking area in addition to whale watching!! I look forward to checking it out. St. John is where the Trans-Canada Highway begins; it ends in Vancouver, British Columbia. Once we hit St. John's, we will have been on every kilometer of that highway as we've once before driven all across Canada on it. I love this exploring and driving! It's such a pleasure to be able to see our country and the country of our neighbors to the North by traveling through so many nooks and crannies of both of them. 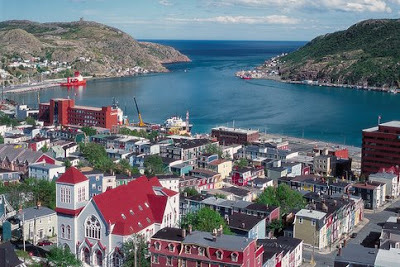 * Photo of St. John's Harbour Narrows courtesy of the internet. My cousin is doing a semester of college in Parma, Italy. She will be there from January to May. During this time, Eddie and I are hoping to go visit and spend two months there. We're thinking maybe Feb/Mar or Mar/Apr but haven't decided yet. The trip hinges on a few other things, so everything has to come together in order for us to go during this time. The question I throw out to all of you is this: What do I need to know? 1. What should we visit in the area? 2. What countries shouldn't we miss? 3. Rent a car or take the train? 4. Get a hotel room or rent an apartment or villa? 5. What kind of access is there to the internet? Are there a lot of those internet cafes you hear of? 6. 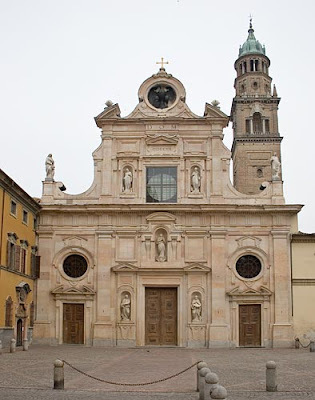 What regions of Italy are a must see? 8. Large purse or backpack? 9. Any special packing tips? 10. What time of year might be best to go? 11. I am very interested in Eastern Europe - any info on that? There are too many questions, I beleive - but you get the idea. I am checking other expat websites to get some information and of course combing the internet, but there is so much information I'm getting overloaded. If you have anything to tell me, please either leave it in comments or email me at thedailyranter@aol.com - I look forward to the info!